There are two kinds of people in the world. Those who enjoy football, and those who don’t. And if you’re from Texas, you not only enjoy it, you adore it because its a way of life. This is where the journey began for NFL Hall of Famer and Super Bowl coach Raymond Emmet Berry. A resident of Murfreesboro, Berry was thrust into the sport of football from the young age of five. His father was a local high school football coach. Naturally, Berry fell in love with football, a sport he would one day be recognized for as one of the best to ever suit up. Berry played started playing once he got into the fifth grade and excelled all through his grade school years. As he moved up into high school, one would assume Berry would be given a spot on varsity. However, coach Berry held his son in check, making him earn everything he worked for. Young Raymond would fight in junior varsity play for two seasons before finally moving up onto varsity his junior year. Even then though, he didn’t make his first start until his senior year. But from that moment forward, it was game on. The young, now groomed 17 year-old would emerge his senior year into a dominant regional player. But with no appealing offers, Berry decided he would start small and work his way up, enrolling in Shreiner Institute. Around this time, in 1953, Elroy Hirsch was a staple in professional football. He had the looks, the skills, and he played in Los Angeles for the Rams. Along the way, Hirsch was branded with the nickname “Crazy Legs” for the way he moved in the open field. Hirsch also had an incredible ability to catch over his shoulder, a skill most didn’t have at the time. Given all that Hirsch had a face for Hollywood, a self-titled movie swept across the theatres of America called simply, “Crazy Legs”. At that time, there were only 12 NFL teams. Since there was no Texas NFL team at the time and since the college freshman, Berry, had never watched the sport on TV, going to see this movie while at in junior college would be a trip that would ultimately change his life. Berry would make the trip to see the movie three times before it left theaters. The effect of that movie would spark a light in Berry, leading him to Southern Methodist University. 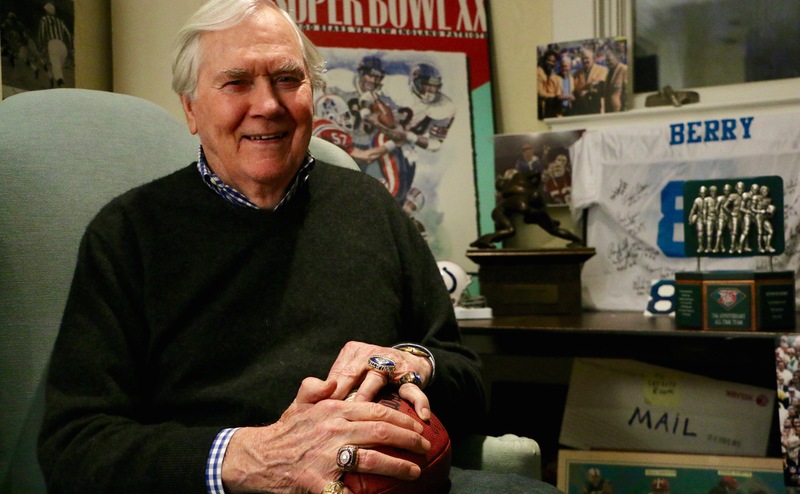 Growing up, Berry had idolized SMU legend Doake Walker. Once Berry got to SMU, it was his mission to catch like Hirsch and run like Walker. But in just two seasons in an offense that was primarily run based, Berry accounted for just 33 catches in three years. Berry was also forced to play outside linebacker, a spot he would excel at. Before the start of his senior year, Berry received a call telling him he was drafted by the Baltimore Colts in the 20th round, overall pick in the 1955 draft. “They took a big risk on me, drafting me in the 20th round and all,” Berry chuckled. While Berry knew he was being drafted for both positions, it was the receiving side he wanted to excel at the most. But for the third time in his career, Berry again had to wait on what good was to eventually come. In his first season in Baltimore, Berry hauled in only 13 catches. Looking to get possibly cut, the Colts would acquire a guy the Steeler’s would cut a year prior, a quarterback by the name of Johnny Unitas, a talent most around the team hadn’t even heard of up to this point. Once Unitas was acquired, Berry’s numbers immediately skyrocketed. From the moment they met, Berry admitted they “clicked”. However, this was was sharpened by the extra time spent after practice that their head coach Weeb Ewbank allowed them to have. The two would form such chemistry together, they would know exactly just how many steps or/and seconds there was to complete a pass. This would come in handy down the stretch as the two would tear apart teams for years to come with their precision, timing, and confidence in one another. In their first year together, Berry would up his numbers to 47 receptions for 800 yards and six touchdowns, a statline that would top all NFL receivers. Check back tomorrow for part two of the four-part series “Raymond Berry: Murfreesboro’s link to pro football’s Big Game” where we talk about one of the NFL’s most historic matchup.